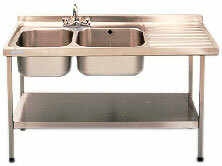 Stainless Steel Sinks for the catering, bakery and food processing industries. Sizes from 1000x600mm to 3000x700mm. single and double bowl units with either left or right hand single or double drainers. Waste disposal and overhead spray units available as options. Hand wash basins with manual, infra-red or knee operated taps, Multi hand wash trough and boot washers available in a range of sizes. Hospital steralising units, sanitary equipment, and catering furniture available. All units delivered carriage paid to UK sites. Most items available from stock for immediate delivery.